March 15, 2018	/ 6:30 P.M. In spite of the global prevalence of fast fashion giants such as H&M or Inditex, Japan still retains a strong domestic market with brands designing and producing exclusively with Japanese consumers in mind. One possible explanation for this may be the way how lifestyle is constructed, particularly in Tokyo as Japan’s main fashion city. 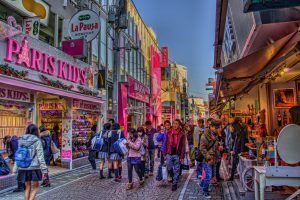 For the world of street fashion, the seemingly small neighborhood of Harajuku has become a nationally as well as internationally renowned hotspot where all kinds of trends are shaped and reinterpreted every day. Harajuku also is a prime example of how social attribution processes work within a city: If popular discourse had not defined and named the area, it would only exist as Shibuya-ku Jingūmae and Takeshita dōri or Cat Street would only be nameless roads. The aim of this research is to explore how this small piece of land came to be recognized as a fashion space from the early 1970s onwards and how it has continued to attract creatives and shoppers alike, even in a fashion world that has seemingly shifted to location-indifferent online media. Combining De Certeau’s concept of social spaces with Namba’s observations on the construction of so-called mental maps resulting from conversations between shoppers and fashion or lifestyle store owners, which in turn enable fashion media to publish actual maps suited to their readers, I incorporate media coverage and printed maps of the area with personal accounts of participants in my research on the formation of this imagined space. Jana Katzenberg obtained her MA degree in Modern Japanese Studies from the University of Düsseldorf and is currently pursuing a doctoral degree in Japanese Studies at the University of Cologne. Previously a PhD fellow at the DIJ, she is currently continuing her field studies in Tokyo. Her areas of research include Japanese street fashion and fashion media as well as subcultures.